As an extension of their 2018 Degree Show work, BA Graphic Design graduates Irene Albino and Ellen Jonsson presented the performative </unravel;> : Histories or Tales of Future Times in the Lethaby Gallery for Creative Unions. 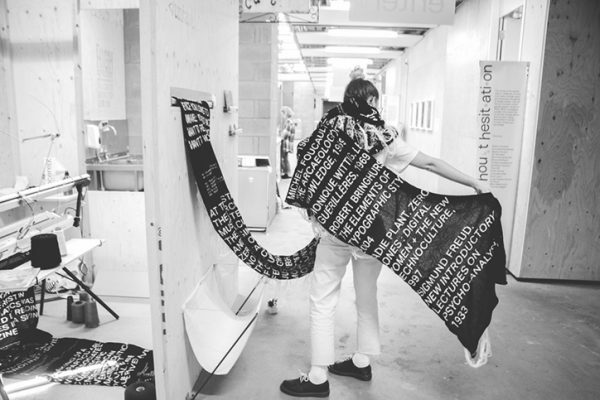 Throughout the duration of the show, a knitted manifesto was produced, chapter by chapter – a fairy tale which unravelled ideas and preconceptions of binaries: craft and design, histories and tales, analogue and digital, female and male, zeroes and ones. 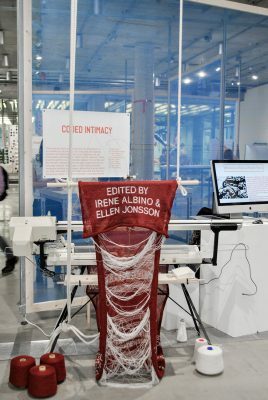 The hacked knitting machine brought together two stereotypically contrasting, gendered activities (computer hacking: male and knitting: female) – a perfect hybrid of two binary systems to challenge the very notion of binaries. Between 3 and 27 October, the tale was gradually woven, each chapter told from the perspective of a new narrator – from end to beginning. The narrative style is inspired by Giovanni Boccaccio’s Frame story from his series of novellas collectively titled The Decameron, which depends on the literary technique of a story within a story. In Boccaccio’s tale, a group of seven women and three men flee from plague-ridden Florence during the Black Death. In a secluded villa, they spend two weeks telling each other stories – changing storyteller each evening. In a similar technique, Albino and Jonsson change narrator and perspective for each chapter of their knitted narrative. At points, they embraced spontaneous, unpredictable contributions. During Creative Unions, this involved impromptu contributions from a pop up poet and gallery staff. 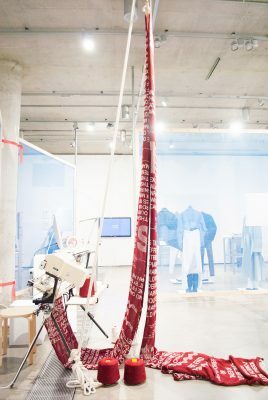 For the performances at Degree Show Two and Creative Unions Albino and Jonsson used an Electroknit Brother 950i from the 1980s – a semi-manual, semi-digital Jacquard loom knitting machine. The project capitalises on the relationship between weaving and coding: “If weaving is a form of coding, we thought how would it be to weave code? In what ways and to what extent can we pursue a mix of old and new technologies?” Invented in 1804, the Jacquard loom is controlled by a number of punched cards – the selection of which creates a continuous, woven pattern. This use of punched cards to control a sequence of operations was an important conceptual precursor to the development of computer programming and data entry. Some early computers received programme instructions from a paper tape punched with holes – a technology that was used in computing until the mid 1980s. Albino and Jonsson’s resulting knitted manifesto can now be seen on view as part of group exhibition Corrrective in the College’s Window Galleries. Corrrective is a design collective of seven recent Central Saint Martins graduates whose practices subvert that which is oppressive and challenge and disrupt what is seen as the norm. Armed with a mindset that lies at the intersection of feminism and queerness, they individually explore topics such as gender binaries, queer politics, decolonisation and their representation within the mainstream. Through a multidisciplinary approach, they aim to come together as a force for change. 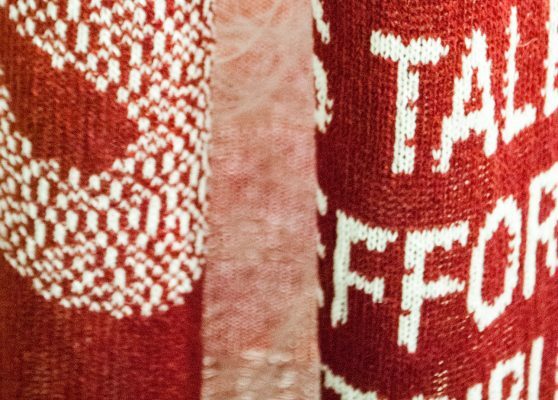 You can also see the first knitted iteration of <unravel;> at Ruskin Gallery as part of group exhibition Decriminalising Ornament:The Pleasures of Pattern until 21 November.